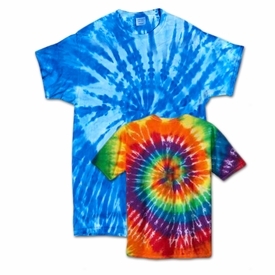 Get ready for the lazy days of summer with these cool looking cotton Tie Dye T-Shirts. Colors may vary due to the unique tie dye process. They have a round neckline. Available in 2 different colors in supersizes 0x through 8x. Please check the measurements below, as the plus size & supersize shirts run much differently! 0x/1x - Chest:50" - Hips:60" - Length:38"
1x/2x - Chest:55" - Hips:65" - Length:38"
2x/3x - Chest:60" - Hips:70" - Length:38"
3x/4x - Chest:64" - Hips:74" - Length:39"
4x/5x - Chest:70" - Hips:80" - Length:39"
5x/6x - Chest:76" - Hips:86" - Length:40"
6x/7x - Chest:80" - Hips:90" - Length:40"
7x/8x - Chest:84" - Hips:94" - Length:41"
8x/9x - Chest:88" - Hips:98" - Length:41"
Please note that all our Tie Dye products are meticulously handmade by an expert artist one piece at a time. Each Tie Dye pattern is unique due to the handmade nature of the coloring process. No two are alike and color may vary slightly. The subtle variations make your purchase special and one of a kind.